ABOVE: Agate counter with lighting underneath that changed colors...WOW! Another new, standout product Cosentino introduced: "Dekton". Dekton is a sophisticated mixture of raw materials that includes glass, the latest generation of porcelain tiles, and quartz surfaces. 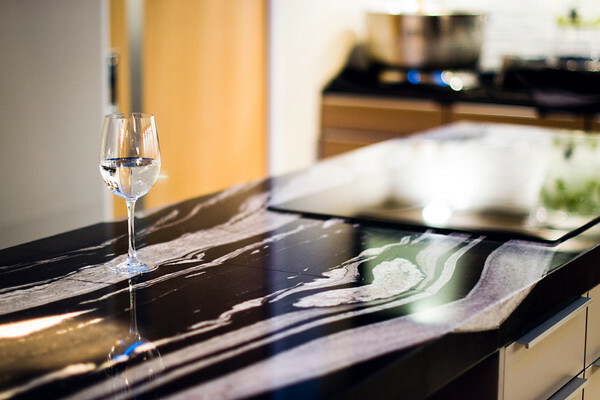 Dekton comes in three thicknesses — one of which is a huge 126” x 56” that's basically indestructible. It has the most scratch resistant surface on the market, withstands high temperatures without cracking or scorching, is non-combustible, and frost-proof. You can even use this product outdoors! One of its most notable colorways is Aura, a white marble look-alike. This product can be book-matched for an even more realistic appearance. It was used in the penthouses on the wall, surrounding a fireplace. Quite remarkable, I'd say. You met these five designers last week on my blog (left), designing away for Cosentino’s Silestone brand. Click here to see what they've been collaborating on with Cosentino. It's becoming obvious that people are itching for something different. And, as evidenced by what I saw at KBIS, it looks like manufacturers have been listening, as there were more quartz options than ever before. If you understand and respect the importance of living a life of wellness by treating it like the beautifully amazing temple that it is (and who doesn't? ), I can't think of a better addition to a master bath than Mr. Steam's iSteam 2.0. Discovered by Carla Aston at the Kitchen and Bath Industry Show (KBIS): Top Knobs' new Transcend Collection is must-have! Click through for my review, product specifications, pictures, and much more! Discovered by Carla Aston at the Kitchen and Bath Industry Show (KBIS): Thermador's new MicroDrawer Microwave is must-have! Click through for my review, product specifications, pictures, and much more! Discovered by Carla Aston at the Kitchen and Bath Industry Show (KBIS): BLANCO'S new ATTIKA Stainless Steel Sink is must-have! Click through for my review, product specifications, pictures, and much more! Live-blogging the most intriguing interior design ideas, insights, and inspirations experienced at 2015's "Modenus Talks", at KBIS 2015! Because I’m a member of the BlogTour team of interior design bloggers who will be covering the event every step of the way, I have access to insider-material that teases what’s to come. Click through to learn what's to come! *Poggenpohl is a sponsor of Modenus BlogTour's Kitchen and Bath Industry Show (KBIS). All opinions contained within this article are those of Carla Aston of DESIGNED w/ Carla Aston and have not been influened by any of the aforementioned parties.